The north stand, where the photos were taken, is only open for big international matches or when seats are nearly sold out. Photo: Facebook. Whatever the quality of the turf at the Ta' Qali National Stadium, most would probably agree that it should be limited to the pitch, rather than spreading into the stands. 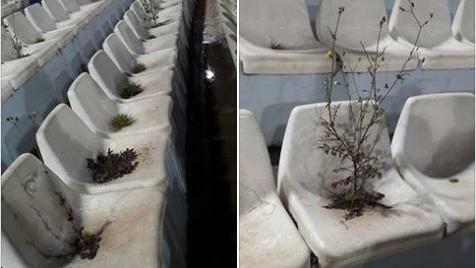 Photos shared on social media show weeds growing through the seats at the north stand, highlighting what fans said was the stadium's current dismal state. The supporters' group South End Core said that although the north stand was only open for big international matches or when seats for local matches were almost sold out, the photos exemplified infrastructural issues that needed addressing all around the stadium. 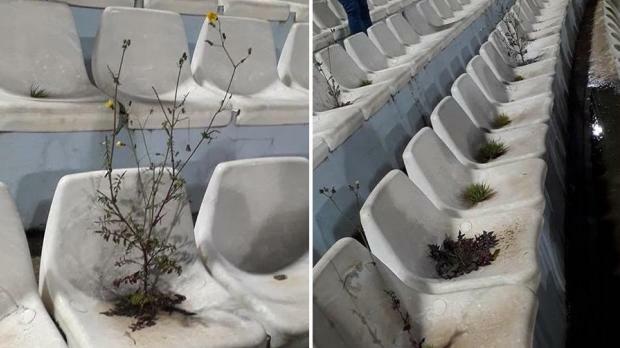 "We call upon all persons and entities responsible for the wellbeing of the national stadium and supporters in order to take action," the group said on Facebook. "This stadium is one of the places that all local supporters visit week in week out and spend time in order to follow their local and national football team. It is our second home." The Malta Football Association announced plans in 2017 to redevelop the Ta' Qali stadium's north and south stands, which are planned to be roofed over and brought closer to the pitch, eliminating the space behind the goals and creating a square configuration.